Following his sexual assault conviction in April, Bill Cosby has been sentenced to 3 to 10 years in prison. Montgomery County Judge Steven O'Neill handed down the sentence, despite the fact that Cosby's attorney, Joseph Green, argued that prison would put his client at risk, given his age and that he's legally blind. Green also cited the fact that Cosby had no prior criminal record. Judge O'Neill ignored the plea and ordered Cosby serve time in prison. O'Neill had this to say in his ruling. "It is time for justice. Mr. Cosby, this has all circled back to you. The time has come." The 81-year old comedian and former star of The Cosby Show was once known as America's Dad. But those days are long behind him. Bill Cosby was convicted on three counts of aggravated indecent assault in April's retrial against former Temple University employee Andrea Constand, who had previously looked up to him as a mentor. The incident took place in 2004. The first trial in 2017 ended with a hung jury after six days of deliberation. It took the jury just 15 hours to convict Cosby earlier this year. 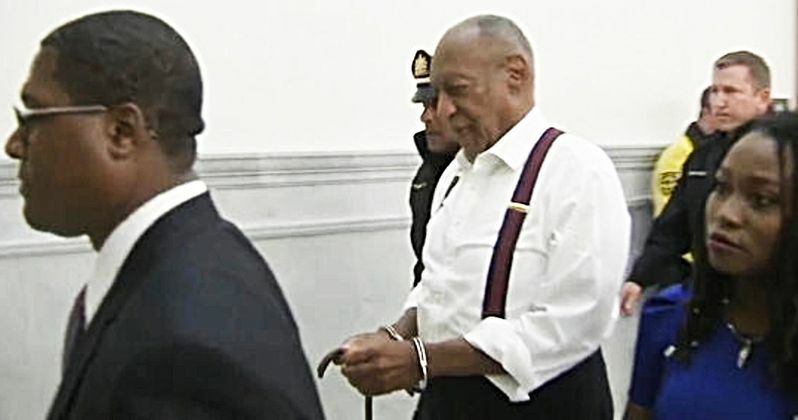 Cosby declined the opportunity to address the court before his sentence was handed down in a Pennsylvania courthouse. Andrea Constand is just one of many women who have come forward to accuse Bill Cosby of sexual assault. The once-popular comedian is said to have drugged his victims and assaulted them after the drugs kicked in. In addition to Constand, nine other women who had accused Cosby of sexual abuse were present in the courtroom when the sentence was handed down. Cosby now becomes the first celebrity of the #MeToo era who will be sent to prison for his sexual abuse crimes. Here's some of what Constand said in her statement to the court. "Bill Cosby took my beautiful, healthy young spirit and crushed it. He robbed me of my health and vitality, my open nature, and my trust in myself and others. I've never married and I have no partner. I live alone. My dogs are my constant companions, and the members of my immediate family are my closest friends." Judge O'Neill declared Cosby to be a "sexually violent predator" in his ruling. This requires him to get counseling monthly for the rest of life, with neighbors and schools needing to be notified as to his whereabouts once he's released from prison. Cosby faced up to 10 years in prison and the prosecutors requested 5 to 10 years, arguing that he could still pose a threat to women. Montgomery County District Attorney Kevin Steele had this to say, rejecting the idea that Cosby's age was reason for clemency. "He was good at hiding this for a long time. Good at suppressing this for a long time. So it's taken a long time to get there." In the time since Andrea Constand, now 45-years-old, came forward to publicly accuse Bill Cosby of his crimes, more than 60 women have accused him of sexual abuse. None of the other accusations have led to charges. It should be noted that Bill Cosby's wife, Camille Cosby, declined to be present at the sentencing hearing. This was previously reported by the Associated Press.